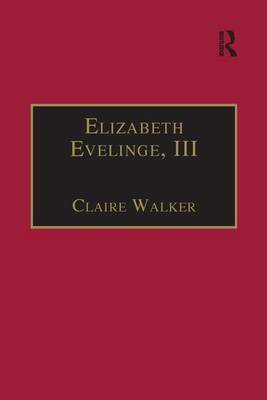 Elizabeth Evelinge, now firmly believed to have been the translator of The admirable life of the holy virgin S. Catharine of Bologna, entered the English Poor Clare monastery in Gravelines in 1620. After ongoing dissension at Gravelines, along with Catharine Bentley (originally believed to be the translator) she founded a new cloister at Aire. Evelinge served as abbess here for 25 years. Her 1621 translation of Catharine of Bologna's life and Spiritual weapons, with their exemplary advice about how to survive the temptations and conflicts of cloistered life, aimed at assisting the troubled English Poor Clares in their time of need. Whether designed to further the Franciscan cause within the cloister or simply to offer solace, the translation of this text occurred because of the dissension in the house at Gravelines. Moreover, it is possible that Catharine of Bologna represented so compelling a model of Poor Clare spirituality that Elizabeth Evelinge, whose piety and talents mirrored those of her subject, deemed herself too humble to ascribe her intellectual achievements to herself, which led to the debate about who translated the text.